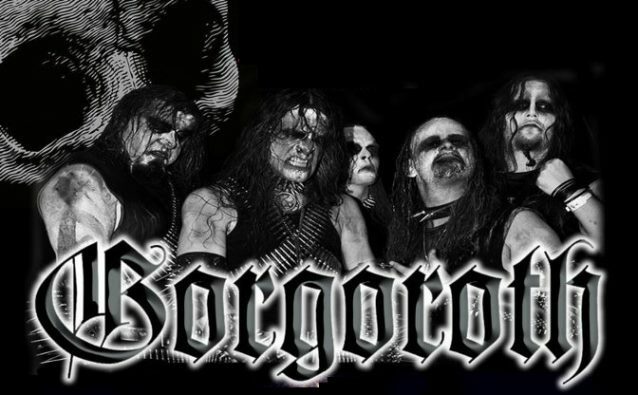 Black metal veterans GORGOROTH have entered the studio to begin recording their next album, "Instinctus Bestialis", for an early 2014 release. The recording lineup for the new CD will consist of Infernus (guitar), Tomas Asklund (drums; ex-DISSECTION, DARK FUNERAL), Bøddel (a.k.a. Frank Watkins, bass, ex-OBITUARY), and new vocalist Atterigner from the Serbian band TRIUMFALL. "Under The Sign Of Hell 2011", the re-recording of GORGOROTH's third album, was made available in 2011. On "Under The Sign Of Hell 2011", Pest and Infernus repeated their roles as vocalist and guitarist/bassist, respectively, from the original 1996 recording, while Tomas Asklund handled the drums. GORGOROTH's ninth album, "Quantos Possunt ad Satanitatem Trahunt", was released on October 21, 2009 in Europe via Regain Records. The CD, which was made available in the U.S. on November 11, 2009, was recorded at Monolith Studio and featured Infernus on guitar, OBITUARY's Frank Watkins on bass, Pest on vocals and Asklund on drums.